Lentils and Brussel Sprouts -- every kid's nightmare and my delight. I think the reason American kids have such immense dislike of all things green is that they've been fed steamed vegetables their entire childhood. So if you've had some bad childhood experiences with brussel sprouts, try this recipe. It's better than therapy for recovering from bad childhood memories. And about those lentils... I know it sounds strange to give thumbs up to a cookbook I don't even have, but I owe those impeccable lentils to Judith Barrett, the author of Fagioli: the Bean Cuisine of Italy. I saw her recipe for lentils in Boston Globe a while ago and that's how I learned to cook perfect lentils -- whole beautiful little beads of earthy goodness, not mushy yet perfectly tender. The trick is to not cover the pan, cook them on very low, and add salt only when they are almost tender. Adding salt late in the cooking of beans is a common trick, but cooking them uncovered is the tip I haven't seen in other books. In my experience, lentils and beans taste best when cooked a day in advance and stored in their liquid. Cut off the ends of brussel sprouts and cut them in half. Place them in a baking dish large enough to hold them in one layer and toss with olive oil, salt and pepper. Roast in the bottom third of the oven for 20 minutes. Stir, drizzle with honey and vinegar (if using), and roast another 5 minutes. Combine lentils and water in a large pot. Cover and bring to a boil. Uncover immediately. Turn down the heat to low and cook at a bare simmer until almost tender, about 20 minutes. Add wine and season generously with salt. Cook another 5 minutes. Take off heat. Set a large skillet over medium heat. Add 1 Tbsp of oil and 1 Tbsp of butter. When melted, add the onions and generous pinch of salt and cook until golden brown, stirring occasionally, about 10 minutes. Drain the lentils reserving the cooking liquid. Add the lentils and 1 Tbsp butter to the skillet with onions and mix well. Keep warm over low heat. Put the liquid back into the lentil pot and reduce by half over high heat, about 5 minutes. Stir in the mustard until dissolved, then whipped cream. Taste and correct seasoning. 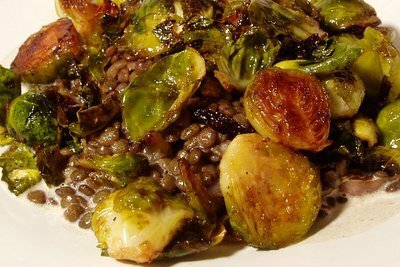 Serve lentils topped with mustard cream sauce and brussel sprouts. Note: The brussel sprouts and lentils taste great even without mustard cream sauce. You can also serve them as two separate dishes. I saw some nice looking Brussel sprouts the other day and although I'm not a big fan of them, this recipe gives me a good reason to try them again. I love Brussel sprouts! I mean, I really love them - I get cravings for them that would be more appropriate for chocolate or pizza. I will definitely try them with lentils, which I also like. Usually, I braise my Brussel sprouts - butter, then chicken stock. Sometimes at the end I add a little maple syrup and toasted walnuts. Yay -- I found another brussel sprout lover :) Your braising method sounds great. I kind of like them crispy, so I usually roast them. When you braise, do they just get soft or do they brown a little? I was thinking of purchasing brussel sprouts to make this recipe. Only problem was I could picture the image and recipe in my head, but I couldn't remember where I saw it. So I am glad that I just found this again. And this time I will bookmark the recipe. I can't wait to try it, this will be my first brussel sprout experience. Wish me luck! Hi Helen! This sounds delicious. I do like burssel sprouts, but on the other hand, I am just plain crazy about lentils. I eat lentil soup at least once a week and usually 2 or 3 timas.. I will definetely try it this weekend! P.S. My cuban grandmother used to add cummin to all legums, specially black beans and lentils.. Welcome to Beyond Salmon. Have fun with lentils and brussel sprouts this weekend and let me know how they come out. I just made this recipe tonight, and it's great! I left out the honey 'cause I didn't have it, and cut the lentil part of the recipe in half. Oh, I also strained the cooking liquid to make sure the cream sauce would be pretty. Even my husband liked it, and he's extremely picky about his lentils. Thanks for an addition to my keeper file! Waaaay to many lentils. 2 cups dry looks like about 6 cups cooked. I would only make 1 c of lentils for 4 people. 1 cup for 4 people works great when it's a side dish, but if you want to serve it as the main course, 2 cups is safer. French lentils don't puff up much during cooking, so it's not like you'll end up with a ton of them. But if you do, they store beautifully in the fridge and are excellent hot or cold. Just made this and omg delicious. What a wonderful combination of flavors. Even my kids ate it.